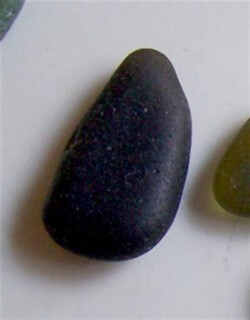 Black Sea Glass found on New England Beach? Not sure if it's authentic black sea glass, the pics I see on the internet are somewhat lacking the polish and shine my find has. It's very light weight, it is not transparent when holding up to the light, and it does not leave any markings when rubbing it on paper. It's glass for sure whether it be authentic, I am not expert and hoping someone can help. In any event it's very pretty. Is black really black? 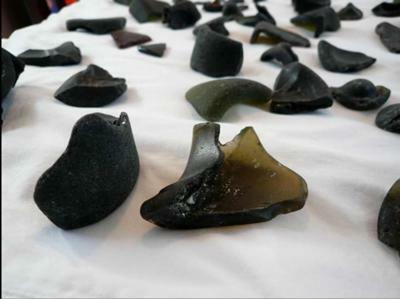 What is black sea glass? How rare is it? How do you tell if its beach glass or a stone? I've found some that I think is glass but not sure. "Hi Paula, That's a coincidence, as. I've read that black glass can appear an olive green or amber color when held up to the light and I'm trying to find out if this qualifies as black glass.